Hyperactive and a real handful, these reptiles rock it hard when they roll. 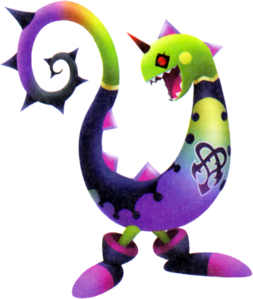 The Hebby Repp is a Dream Eater that appears in Kingdom Hearts 3D: Dream Drop Distance. The Hebby Repp is a creature that resembles a fusion of a snake and lizard. It has a curve-based structure with a spiked spine. It has multiple teeth along with a horn resting atop its head. There is no visible nose. The Hebby Repp's Japanese name, "Hebi Tokage", combines the Japanese words for "snake" (蛇, hebi?) and "lizard" (蜥蜴, tokage? ), that resembles its features of the fusion between the two animals. Its English name, "Hebby Repp", is based on its Japanese name, as well as "reptile", the class of animals to which snakes and lizards belong. As a Spirit, the Hebby Repp has a yellow head, with two pink spots as cheeks, and white, pointy teeth. It has black, squared eyes with orange pupils bisected with a black line. Purple spikes line its head down its spine. The Spirit emblem is located on its colorful underbelly, that is sky-blue, fading into pink, orange, and green. Its back is dark-blue, but can be changed using Paint Guns. 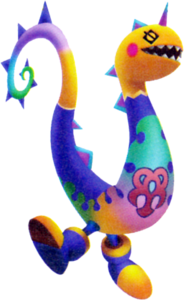 Its body ends in a yellow coiled and dark blue-spiked tail that melts into a light purple, light blue, then finally green. It has two thin, dark-blue legs and it wears dark-blue and yellow shoes. As a Nightmare, the Hebby Repp has a lime colored head, with two yellow spots as cheeks, and white, pointy teeth. It has red, squared eyes, and black spikes line its head down its spine. The Nightmare emblem is located on its colorful underbelly, that is lime, fading to purple. Its back is purple, and its body ends in a lime coiled and black-spiked tail that melts into an orange, purple, then finally black. It has two thin, lime legs and it wears purple and black shoes. ↑ 1.0 1.1 Becomes available when in Wheeler disposition. ↑ 2.0 2.1 Becomes available when in Salamander disposition. The Hebby Repp Recipe can be purchased from the Moogle Shop for 50 munny. The Hebby Repp can be created through six different recipes. The fifth recipe is a rank B recipe that has a 70% chance of success.